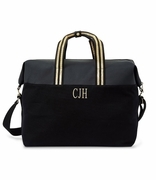 Monogram seersucker tote bag. 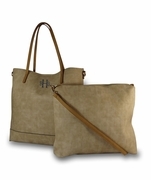 Classic seersucker is timeless and this tote is up-to-the-minute fashion. In a delicate pink and white stripe, it is ideal for shopping at the mall, a relaxing day on the beach or lounging by the poolside. For Moms with small children, use it carry baby diapers and bottles or kiddies toys to keep them occupied in the car. Pair with a matching seersucker make up bag WB-M725SPK, duffle bag item WB-M300SPK plus garment bag and you have the perfect weekend-away luggage set. The bag is lined in hot pink and sports a matching hot pink handle for a fun wow-factor!